I was recently reminded of a talk that Ahold and IBM gave in 2011 at the Material Handling Conference in Park City Utah. Ahold is an international retailing group based in the Netherlands. Ahold had revenues of 29.5B Euros in 2010. Ahold USA is a wholly owned subsidiary of Ahold. Ahold USA operates Stop & Shop, Giant, and Giant Martin’s stores as well as the on-line grocer Peapod. Inbound Logistics ran an article on network design at Schwan’s Home Services. Schwan’s Home Services runs a direct to consumer delivery business for food products. 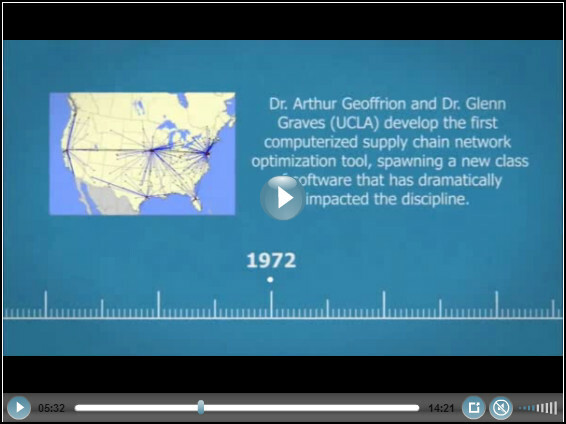 Before network optimization, they served 90% of the continental US with 475 company owned depots. The depots each had around 10 to 15 trucks to make the deliveries. The depots were replenished from their central warehouse in Marshall, MN. They used Deloitte Consulting to help with the modeling and to bring and outside perspective. The article does a nice job in explaining the unique nature of Schwan’s Home Services’s labor and sales intensive business. It also does a nice job of pointing out the the fact that the network modeling team had to communicate and get the buy-in from many different stakeholders within the company. These projects are always a mix of quantitative analysis (and they used IBM’s LogicNet Plus) and qualitative factors. Additionally, Schwan’s has migrated to a hybrid model that uses existing company-owned depots, master depots with hub-and-spoke shuttle systems, and 3PL-managed facilities. As the company removes and/or re-tasks nodes, the network continues to change—setting the stage for further optimization in 2013. While the financial impact of Schwan’s network optimization is under wraps, it achieved marked operational and asset appreciation savings, in addition to avoiding some cost and gaining revenue from the sale of assets. The article is worth a read. This is a nice case study of a network design project.